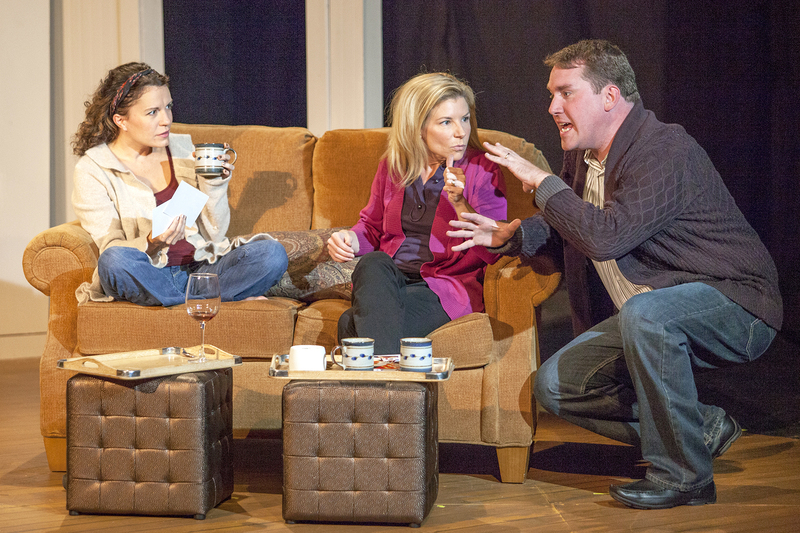 Sarah Cannon, Chad Morris, Michelle Hand and Christopher Hickey star in the Dramatic License Production of “Dinner With Friends.” Photo credit: John Lamb. We all have friends who- even as our dearest friends- can bore us to tears with stories of their favorite causes, vacations or anything else that we could care less about. Gabe and Karen are that way with Beth about food and their latest trip to Italy. When they sense Beth’s inattentiveness to their ramblings about the great Italian woman who gave them the recipe complete with photos and intimate details about the type of tomatoes she uses, they chalk it up to just that- boredom. But something deeper is lurking behind her distraction and her sudden flow of tears starts us on this incredible journey. “Dinner With Friends” won playwright Donald Margulies a Pulitzer Prize in 2000 and several other awards and nominations. It’s easy to see why with the excellent Dramatic License Productions’ cast leading the way with this complicated look at marriage, friendship and human nature. We soon learn from Beth that her husband Tom has left her for another woman and, despite her story of him being in Washington on business, he is really meeting with his mistress. As both couples’ children interrupt from upstairs where they’re watching a video, the story shocks Gabe and Karen who had introduced the couple eleven years earlier. Sarah Cannon and Michelle Hand listen as Christopher Hickey explains a culinary detail during “Dinner With Friends” at Dramatic License Productions. Photo credit: John Lamb. As this wonderfully crafted play progresses, we see Tom’s reaction to Beth “getting the first shot in” to their friends and a very unexpected end to their very heated argument. 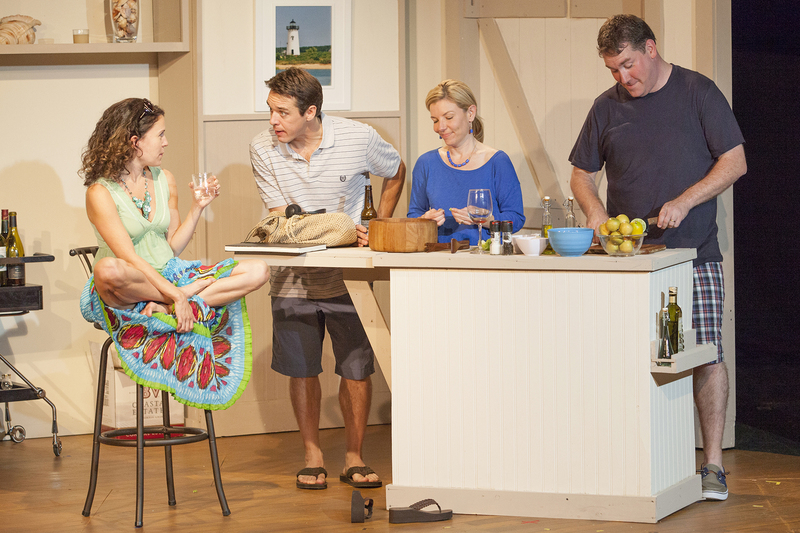 As the second act opens, we flash back to their first introduction at Martha’s Vineyard as Tom and Beth get to know each other while Gabe and Karen are pleased that their respective friends seem to have “found each other.” As the play jumps back to present day, more facts about the marital break-up muddies the waters of Gabe and Karen’s presumptions and makes them question their own seemingly solid marriage. “Dinner With Friends” is a thought-provoking piece in many ways as the various levels of love and friendship begin to slowly reveal that there are even more than two sides to every story. This cast is simply outstanding- there’s not much else you can say. Michelle Hand is rock-steady as Karen showing concern and surprise on several levels as those various levels of truth begin to unravel. As her husband, Gabe, Christopher Hickey delivers a brilliant, low-key performance that becomes the foundation of this tangled web as he tries to hold it all together. Sarah Cannon brings multi-dimensional power to her portrayal of Beth. From the opening emotional scene through the naive young artist and into a more worldly-wise and sophisticated woman, she is stunning. And Chad Morris also shines as a passionate Tom who may hold the key to the failed marriage but also reveals why he may not be to blame as we first may think. It’s a delightful enigma of strong relationships and why they’re not always what they seem. Michelle Hand and Christopher Hickey contemplate their future after the startling events of “Dinner With Friends” at Dramatic License. Photo credit: John Lamb. Director Gary Wayne Barker has pulled every ounce of emotion from these four brilliant actors. From staging to body language to gestures and facial expressions, we get insight into every twist and turn of this plot. Although the play is divided into several scenes, the clever Jason Coale set design gives us as little distraction as possible as we move from on setting to the next. In fact, the evening I saw the play, we had an impromptu intermission thanks to a fire alarm about five minutes before the end of Act I that evacuated the entire Chesterfield Mall. That was more disconcerting than any scene change but the actors- in particular Christopher and Chad- were able to get us back on track and into this emotional roller coaster without missing a beat. This is a remarkable production with solid direction and four of the finest actors you’ll see together on any local stage. They wring every tense moment from the script along with the myriad of laughs along the way. I guess you could call it a “dramedy,” but it’s really a domestic pastiche with multiple surprises along the way. Don’t form an opinion after the first scene, because that opinion will change many times throughout the evening. That’s why it’s a Pulitzer Prize winner. Don’t miss “Dinner With Friends” at Dramatic License through September 30th. Call them at 636-220-7012 or online at http://www.dramaticlicenseproductions. org for tickets or more information. This entry was posted on September 16, 2012 at 9:43 pm09 and is filed under Uncategorized. You can follow any responses to this entry through the RSS 2.0 feed. You can leave a response, or trackback from your own site.